April is EAT LOCAL month again! Last year we announced that April would be EAT LOCAL MONTH. It was a great success, so we’re bring it back for 2014. 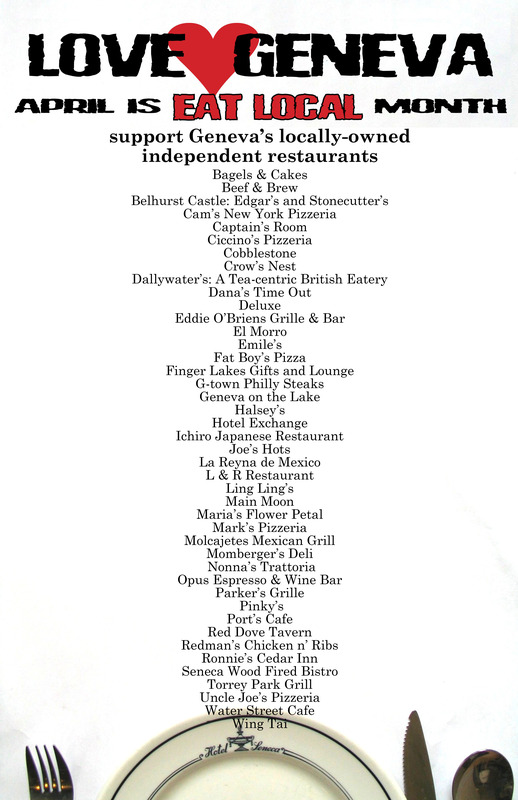 Sadly, we have recently lost a couple of locally-owned restaurants in Geneva. But the overall number has actually GROWN in the past year. The fact is that independent, locally-owned restaurants are one of the backbones of our local economy. They provide valuable direct employment to many people, they are an important source of tax revenue, they draw outsiders to our community — who then shop in other Geneva stores, and they often support local and regional farmers, as well as other locally-owned businesses (from accountants and lawyers to carpenters and electricians). And they give back to the community in numerous ways — including donating food to the needy and supporting various fundraisers for community projects. We’ve launched a poster campaign to help promote APRIL IS EAT LOCAL month. Please patronize independent, locally-owned restaurants as often as possible during April — and beyond. Encourage your friends and co-workers to dine local. Many of you probably already patronize your favorite local restaurant, but consider expanding your horizons and dine at a locally-owned establishment on the list that you have never tried before!